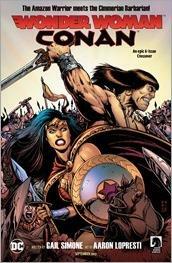 Home » Comics » Wonder Woman Conan #1 Review! Wonder Woman Conan #1 Review! Written by: JediJondee46 on September 22, 2017. This comic is a dream for writer Gail Simone who did an incredible run on Wonder Woman and co-wrote the Conan Red Sonja limited series with Jim Zub. Here she collaborates with Aaron Lopresti (whom she worked with on Wonder Woman). Conan has clashed with superheroes before including Thor in What If #39 (1983) and Wolverine in What If #16 (1990). This may be an alternate world, but seems rooted in Conan’s world of Hyboria. The first issue from DC Comics with Dark Horse bringing the Conan character is entitled “A Crow Without Mercy.” In a flashback, a blacksmith, Conaldar, goes with his young son, Conan, to a war council. At a tent guarded by a warrior woman, Conan is stunned to see a dark haired girl named Yanna. In a two page spread, Conan encounters three Aesir warriors about to torture an Aquilonian man. The Aesir tell Conan not to interfere and he is tired, but the man offers a rich bribe. The action is grisly, appropriate for a Conan tale, and Lopresti keeps it going with interesting angles, this is refreshing even after reading tons of Conan comics. Conan discovers the man, Kian, was being confronted by the Aesir over a debt. The man, is thin and wiry, he has what he thinks is a sure fire bet in the arena. Meanwhile, two crows are feeding on the remains and talking to each other with skulls in their eyes. Goddesses or magical beings? Could they have brought Wonder Woman to this world? The arena champion of Shamar is a dark haired woman in chains. The slaver, Dellos, whom she fights for calls her “Island Flower”, but she doesn’t remember anything. He introduces her in a two page as the “Warrior Witch” to the crowd. Kian has brought Conan to watch. A boy, Tyas, asks for money for food from Conan, but is brushed off. The warrior woman takes on three men with weapons. Conan is stunned and believes the woman is Yanna. Conan bonks Kian on the head. The “Warrior Witch” defeats the arena warriors and there is a brief flashback to young Conan meeting Yanna. The crows watching the battle shift into dark haired women dressed in black feathers. The woman is thrown into the dungeon and dreams in a flashback of an island where she uses a lasso on a shark. Conan finds Tyas bullied by other kids and scares them off to ask for Tyas’ help entering the arena. The woman in her cell wakens to hear Conan. She crosses the bracelets and chains and says that she is Wonder Woman! Conan asks if she is Yanna, but she doesn’t remember. Conan is knocked down by one of Dellos’ guards and he finds the two amusing so latches them into a chain to fight to the death in the arena! This is an incredible beginning for this series with many mysteries. The action is pure Robert E. Howard Conan, but we don’t get full Wonder Woman at this point. Five Swords out of Five!